If there was a special forces regiment made up only of spider cranes – stay with us – what spider crane would definitely be featured? 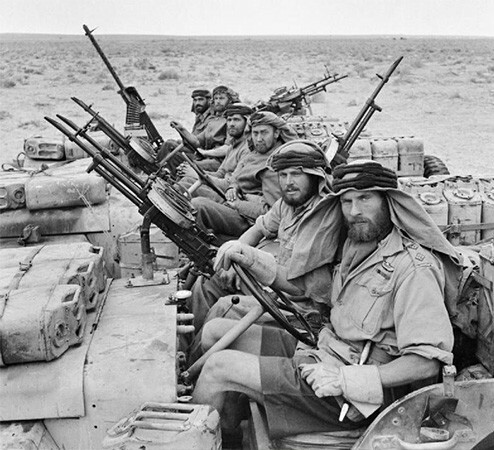 Most experts agree that many Special Air Service soldiers do not look much different to other fit men. It is when they are asked to do something physically extraordinary that they reveal their great strength and stamina. 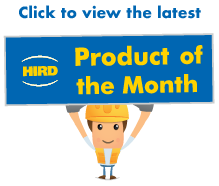 Well, the same goes for our product of the month for February. The UNIC URW-295 spider crane looks, at first glance, like other similar-sized spider cranes available for hire from Hird, such as the UNIC URW-094 and the UNIC URW-095. But the UNIC URW-295 tracked spider crane is the special forces solider of mini cranes, because – with a maximum safe working load of 2.9 tonnes – it has nearly three times the lifting capacity of its namesakes. A lot is talked about the SAS. I recurring theme is that it is often an advantage, certainly not a disadvantage to be relatively short. Apart from the Napoleon complex – short and aggressive – slightly more squat elite soldiers are said to have a better power to weight ratio, so they can go on for longer, certainly when rations are running low. They also make a smaller target! 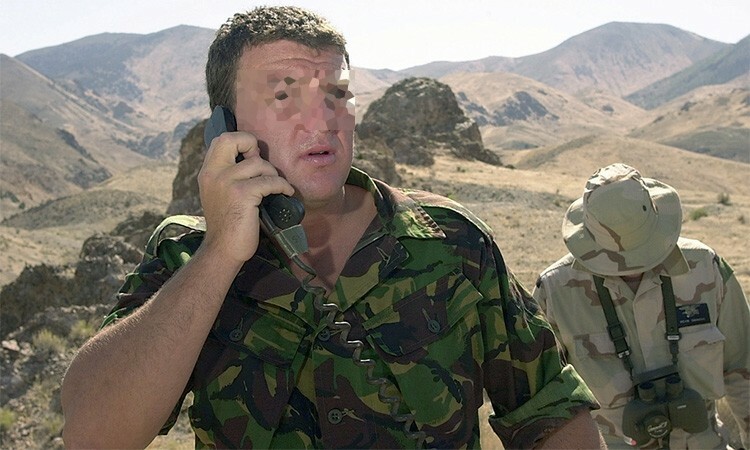 All this is inconveniently contradicted by the fame of Lofty Large – one of the most famous ever SAS soldiers, and at 6ft 6ins in his desert boots, one of the tallest. But the point can be made – you do not have to be big to be effective. And that certainly applies to the UNIC URW-295 spider crane. 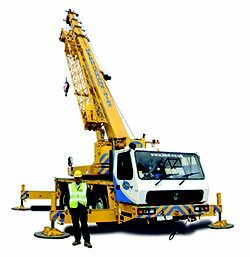 As mentioned, at 600mm wide, 1375mm wide and 2690mm long, it has the same dimensions as the UNIC URW-095 mini crane, which has a max SWL of 0.995 tonnes – but can lift nearly three tonnes. The UNIC URW-295 spider crane has a maximum tip height of 8.8 metres – eat your heart out – and a maximum radius of 8.41 metres. 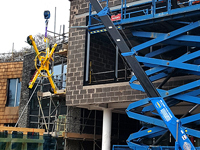 To keep the special forces analogy going, like an SAS soldier with his array of weapons and gadgets – this spider crane can be fitted with a wide range of attachments for specialist lifting. 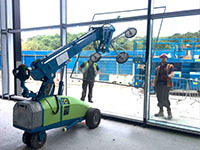 These include vacuum lifters, also available for hire from Hird, for installing glass, plasterboard, glass-reinforced concrete panels, and sheets of metal or plastic with military precision. The UNIC URW-295 spider crane can even extend its capabilities, with height and reach extended with the fitting of a fly gib or a searcher hook. Just like SAS soldiers (have we overdone the comparison yet? ), staying safe while faced by multiple potential hazards is also important for the UNIC URW-295 spider crane. It has load monitoring fitted as standard, which incorporates a m safe load indicator to prevent the mini crane operating outside its safe working envelope. The crane also has an over-winding alarm. And being narrow and compact enough to be taken through a single doorway, it is the mini crane you would want with you in a tight spot. A bit like an elite soldier. The mini crane is petrol-powered, with an option for LPG dual power as well. And it can be fitted with low marking tracked – well, stealth is a key attribute of a special forces soldier. 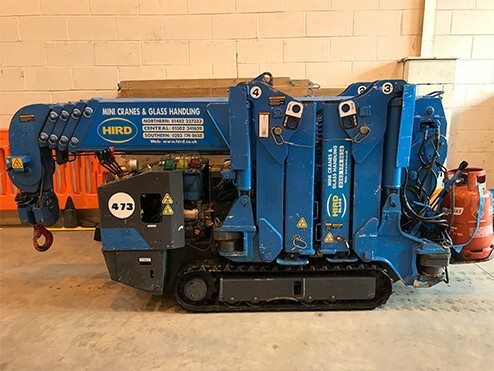 If you need a spider crane hire option that gives you excellent performance in confined spaces, both internally or externally, or working across uneven ground, but with real lifting grunt, the URW-295, available for hire from Hird, could be the right choice. It really is the special forces mini crane – your lifting project will not know what has hit it. 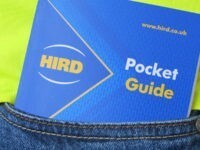 Call Hird for a full range of mini crane hire options, including Maeda mini crane hire, and mini crane operator training, or to discuss Hird’s contract lifting service.